And yet. Yet when I had begun to pass into the realm of chaos this time, I had been think­ing of Frank. And I had felt him, I was sure of it. Some­where in the void had been a tiny pin­prick of light, and he was in it. I knew. I knew also that there had been anoth­er point of light, one that sat still beside me, star­ing at the stone, cheeks gleam­ing with sweat in spite of the chill of the day. At last he turned to me and grasped both my hands. He raised them to his lips and kissed each one for­mal­ly. My lips were too stiff to speak, but the expres­sion on my face must have been as eas­i­ly read­able as usu­al. Jamie caught me by the shoul­ders, pulling me to my feet and shak­ing me gen­tly in sup­pli­ca­tion. “There’s noth­ing for ye on this side, lass! Noth­ing save vio­lence and dan­ger. Go!” He pushed me slight­ly, turn­ing me toward the stone cir­cle. I turned back to him, catch­ing his hands. “Is there real­ly noth­ing for me here, Jamie?” I held his eyes, not let­ting him turn away from me. He pulled him­self gen­tly from my grasp with­out answer­ing and stood back, sud­den­ly a fig­ure from anoth­er time, seen in relief upon a back­ground of hazy hills, the life in his face a trick of the shad­ow­ing rock, as if flat­tened beneath lay­ers of paint, an artist’s rem­i­nis­cence of for­got­ten places and pas­sions turned to dust. I looked into his eyes, filled with pain and yearn­ing, and he was flesh again, real and imme­di­ate, lover, hus­band, man. I saw the clump, and saw what he was point­ing at, the half-ruined crofter’s cot­tage, aban­doned on the haunt­ed hill. “I shall go down to the house, and I shall stay there ’til the evening. To make sure—to be sure that you’re safe.” He looked at me, but made no move to touch me. He closed his eyes, as though he could no longer bear to look at me. 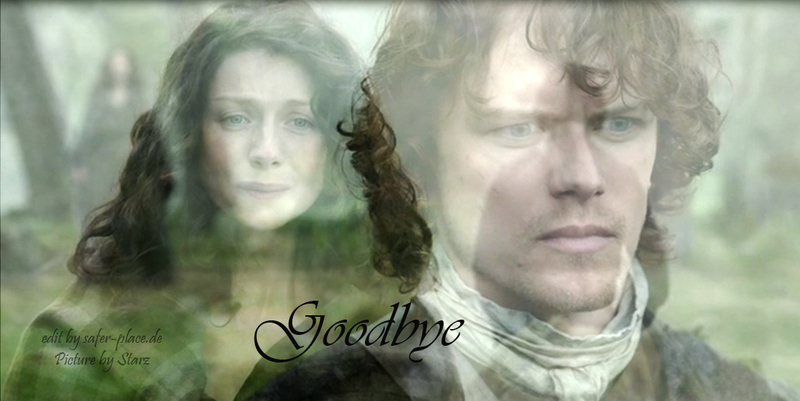 “Good­bye,” he said, and turned to go. “Aye,” he said qui­et­ly, so qui­et­ly I could hard­ly hear him, beneath the whin­ing of the wind. “Aye, I hear.” He dropped my hand. “Go wi’ God…mo duinne.”He stepped off the ledge and made his way down the steep incline, brac­ing his feet against tufts of grass, catch­ing at branch­es to keep his bal­ance, not look­ing back. I watched him until he dis­ap­peared into the oak clump, walk­ing slow­ly, like a man wound­ed, who knows he must keep mov­ing, but feels his life ebbing slow­ly away through the fin­gers he has clenched over the wound. Ratio­nal­i­ty did not appear to be help­ing much. I turned to emo­tion, and began, shrink­ing from the task, to recon­struct the details of my mar­ried lives—first with Frank, then with Jamie. The only result of this was to leave me shat­tered and weep­ing, the tears form­ing icy trails on my face. Well, if not rea­son nor emo­tion, what of duty? I had giv­en Frank a wed­ding vow, and had meant it with all my heart. 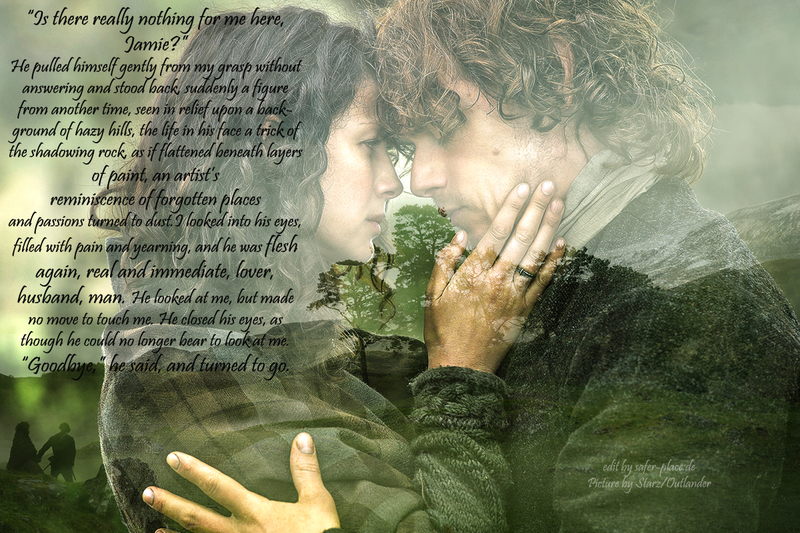 I had giv­en Jamie the same, mean­ing to betray it as soon as pos­si­ble. And which of them would I betray now?